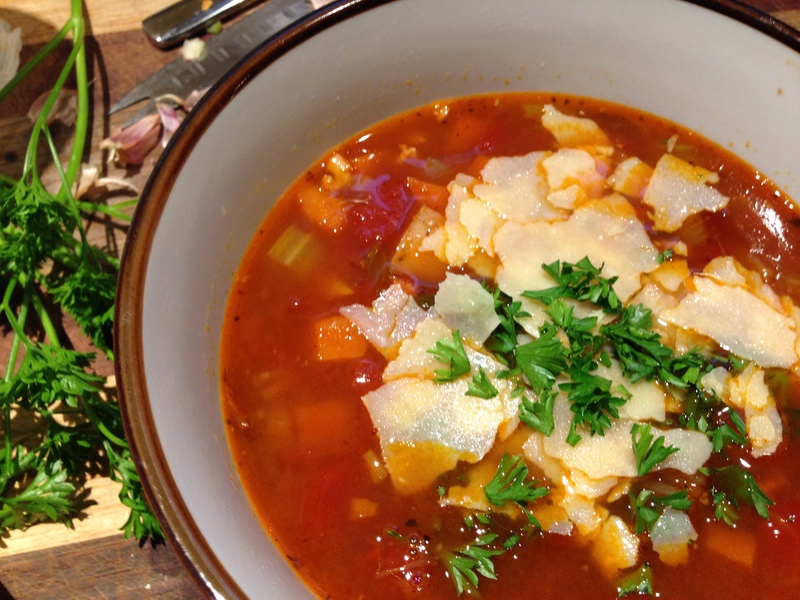 This wholesome soup is made on a base of my bone broth, so that it’s extra nourishing. I’ve also swapped out the traditional pasta for a couple of home-grown potatoes. Pasta gets very gluggy on a reheat, but if you’d like to add some in I’d use about half a cup and turn your heat to high just before the end of the soup cooking time, make sure there’s enough liquid, put pasta into soup and cook til al dente. 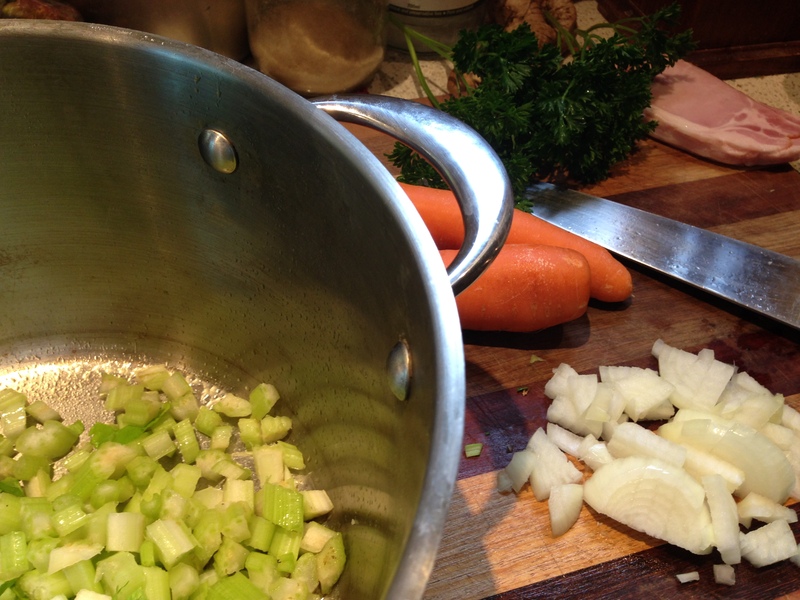 I also confess to making this soup often as a fridge clean-out: chopping and adding in handfuls of whatever vegetables or cold roast meats or smallgoods are left at the end of my week. Don’t be afraid to be veer away from the recipe and go with what’s to hand. It’s a robust recipe that can take a little variation. Last night it was stormy and I sat up in bed with my bowl of soup, listening to rain on the roof before snuggling back up under the covers for a good night’s sleep. Perfect healing environment! 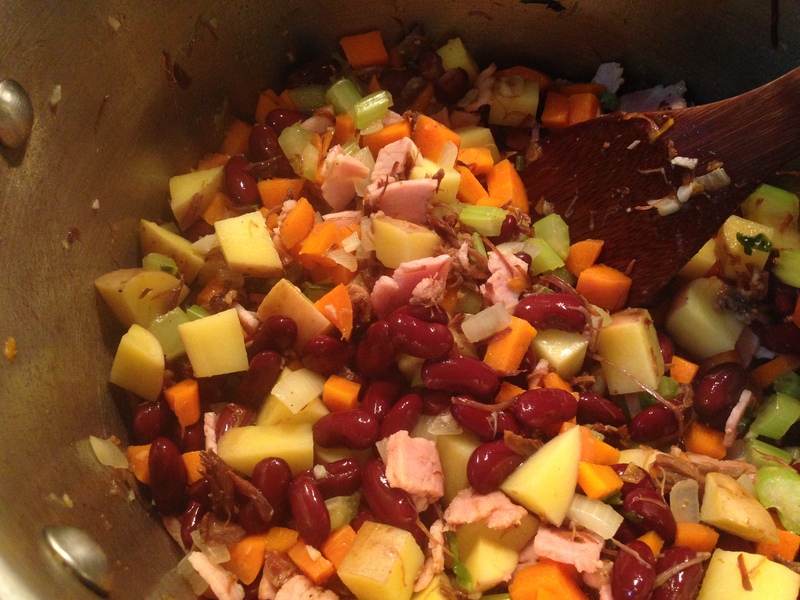 Note: If you prefer, you can make this on a chicken stock base, or for vegetarians and vegans use a vegetable stock base, omit the bacon, and add in a second tin of beans of your choice. 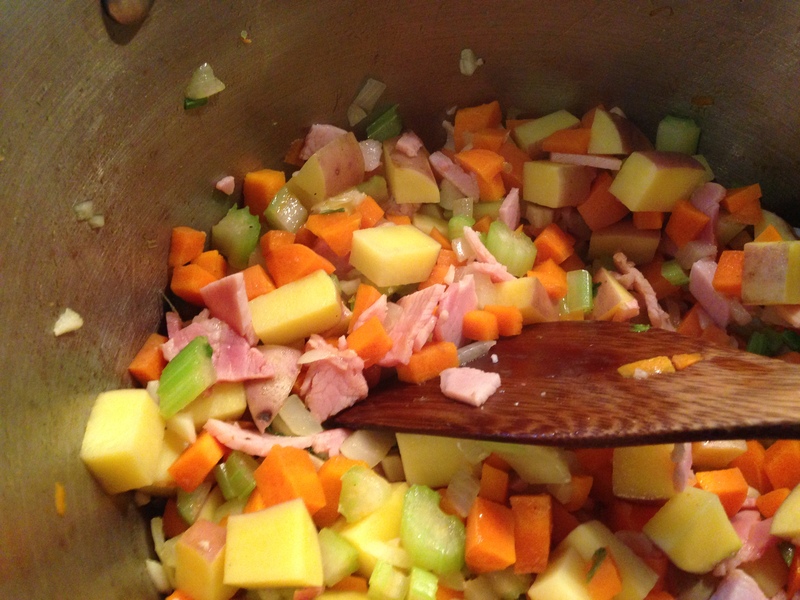 1 x large onion, 6 x garlic cloves, 2 x carrots, 2 x celery stalks, 4 large rashers of bacon (about 200/250 grams), 2 x medium sized potatoes (or sweet potato) washed but with skin on, 8 cups of beef bone broth (or your favourite stock), 1 teaspoon of dried Italian herbs, 2 tablespoons finely chopped parsley, 1 x tin of diced tomatoes, 1 x 300g tin of red kidney beans – rinsed and drained, 1 x tablespoon of olive oil, 1 x tablespoon of balsamic vinegar, salt and pepper to taste. Optional: 2 tablespoons of sherry, a handful of shredded cooked beef salvaged from the bones you made your broth with, shaved parmesan cheese and finely chopped parsley to garnish. Wash, drain and chop all vegetables. Dice bacon. Shred or chop beef into small pieces if using. 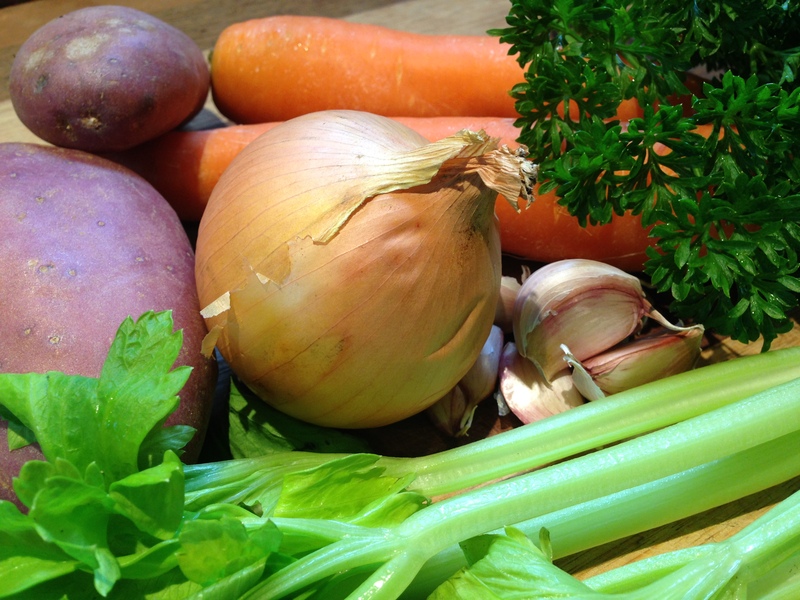 Place your vegetables and bacon in a large saucepan or slow cooker, drizzle over the oil and stir over medium heat until slightly browned and fragrant. Now add in your drained beans and the shredded beef if you are using it. 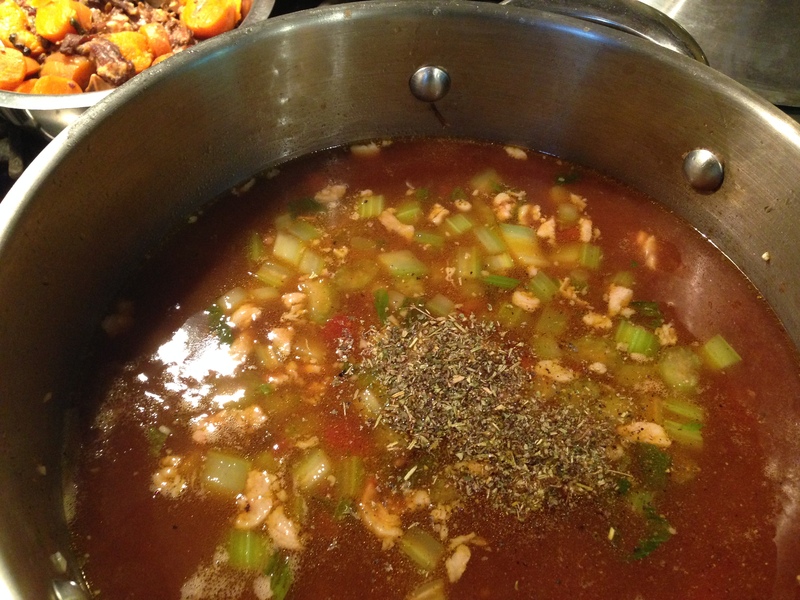 Adjust seasonings as required if it needs more salt or a little more pepper. If freezing soup, cool on the stove for twenty minutes before putting into containers. 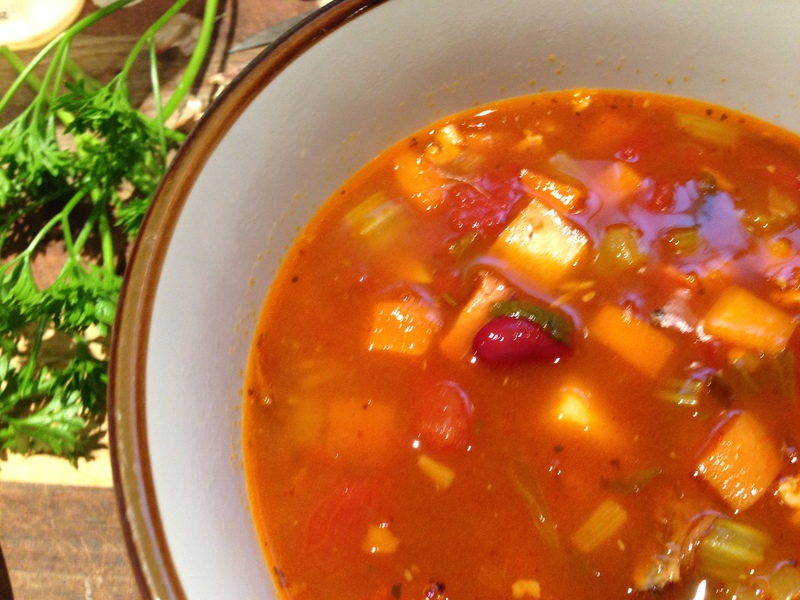 Soup will hold in fridge for five days, or transfer to freezer and store for up to three months. 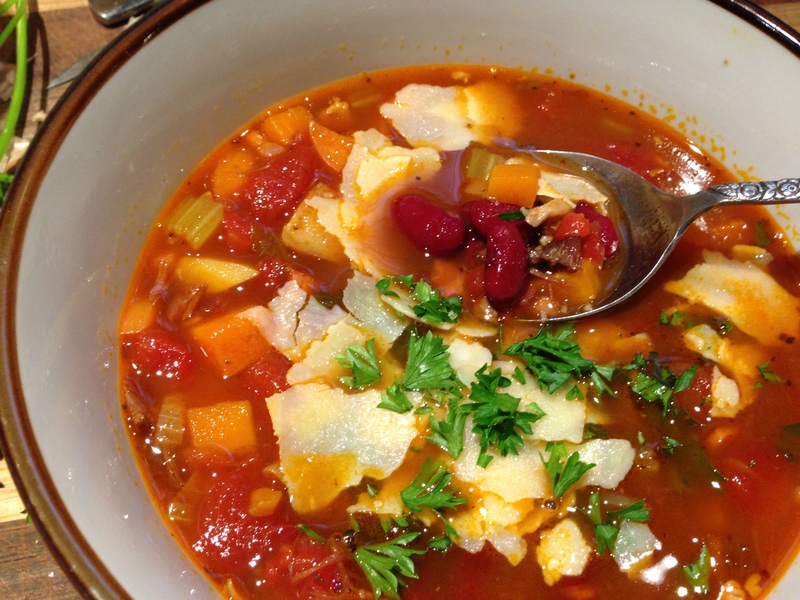 This entry was posted in Gluten-free, Slow Food, Soups and tagged beef and vegetable soup, beef minestrone recipe, easy beef soup, easy meal ideas, easy minestrone soup, easy soup ideas, farmhouse cooking by Cauldrons and Cupcakes. Bookmark the permalink. I hope today is a promising day for you. I can not begin to tell you that wonderful image I have of you ,all tucked up , rain on roof , minestrone soup …so wonderful …no Harry or Burt ??? ?